Looking to send flowers to San Francisco, California? Find the best florists with Teleflora! There is nothing quite like the surprise of receiving fresh flowers for a birthday, or anniversary flowers to celebrate a milestone. Let us help you send a wonderful gift that will leave a lasting memory with your loved one. If you aren’t a resident of San Francisco, shopping for flowers online is often confusing. It can be difficult to find a local San Francisco flower shop you can trust. Teleflora has an extensive network of San Francisco florists, pre-screened and able to deliver to your recipient’s door. Shopping with Teleflora is easy, whether online or by phone. You can choose from hundreds of bouquets, from friendly “Thinking of You” flowers to romantic roses. There’s a bouquet for every style and color, too, from modern Zen arrangements to a bouquet in a classic Victorian teacup. 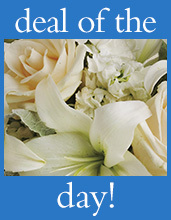 Once you choose your gift, Teleflora sends your order to a member florist in San Francisco. You can even have same-day flowers delivered to San Francisco if your order is placed before 12 noon! When it’s time to check out, just specify where you want the flowers delivered. If you’re sending get well flowers to Saint Francis Memorial Hospital or UCSF Medical Center, the florist will just need the room number and can handle the details. For sympathy flowers, you can also specify which funeral home or cemetery the flowers are going to, including Rincon Hill Cemetery. Our network reaches beyond the city limits of San Francisco, so trust Teleflora the next time you send flowers to the Bay Area and beyond.